There are a few tech tools that I regularly use to facilitate this model. The first is YouTube. Below is one of the flipped lessons I created on writing introductions, which I delivered on YouTube and posted in our learning management system. If you check out my YouTube channel (youtube.com/mrsneebe), you'll find a playlist on writing instruction that coordinates with the writing handbook that all of my students have in their iBooks as a reference. The second tool is Google Drive. Hands down, this tool has changed my classroom more than any other. As a Google Apps for Education school, we rely on Google Drive as our central storehouse for student work -- everything from class notes to lab reports to essays. This year, I switched our entire writing process over to Google Drive as well. Now, my students share their drafts-in-progress with me, and I can view and comment on their writing at every step in the process. Each student has a folder, and each part of the assignment (research, citations, drafting) has its own doc. Drive has empowered me to truly scaffold the writing process, and to invisibly differentiate the type of support I provide to students with varying needs. I have included some screenshots below of what the writing process looks like on Drive. Balancing Books. Over the years, I have grappled with the issue of book selection. Namely, I have struggled to find the balance between having kids read only what they love (Dan Brown mysteries, anything by John Green, books with vampires. . . . ) or having them read only what I think society thinks they'll need to know (the Canon). And for so long, I've seen this issue as an "either-or" instead of an "and." Here's where I am these days: In class, I'll help students piece through the books that are core to understanding our culture, its history, and the literary traditions that have shaped society. We'll read -- together -- the books that have most adeptly criticized society, and those that clearly stem from some sort of social challenge. As a result, my required book lists look pretty traditional. 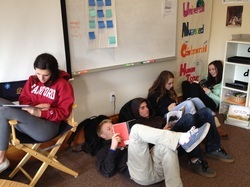 BUT, outside of class, I invite students to read widely and read wildly. I have moved away from assigning class texts as reading homework. If it's challenging enough to warrant class instruction, it's probably challenging enough to read in class. At home, students have choice, time, and interest on their side. They still read every night, and update their progress, likes, and dislikes on Goodreads. They still conference with me about what they read, but they pick the books. This means I celebrate Hemingway and Hosseini, Salinger and Stockett with equal enthusiasm. And why wouldn't I? I'm in the business of making readers, and ultimately, making myself obsolete in the process. Cracking the Canon: Each year, my sophomores begin the year with the most challenging text they will read in the course: The Scarlet Letter. It is a tremendous leap from the expectations of Freshman English, and is often the experience that leaves struggling readers in the dust. As a course team, we have debated the value of starting the year with The Scarlet Letter. Is it too hard? Is it truly rigorous, or just plain difficult? Ultimately, we decided that teaching a US Literature course without seminal texts like The Scarlet Letter (and Huck Finn, and Gatsby…) would be a disservice to students. We believe that part of building their “cultural capital” means teaching this text. But, that left me wondering – how can I teach this text and teach my struggling readers? I wrote the Scarlet Letter Interactive iBook as an attempt at both teaching the classics, and supporting struggling readers who would rather read anything but the classics. In addition to presenting a fully searchable, tap-and-define version of the original text (which is fortunately in the public domain), I embedded before, during, and after reading prompts to promote self-explanation while reading. 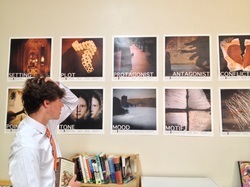 I also partnered with student artists to infuse the text with images, and interviewed colleagues for video footnotes to give students access to content they may not have otherwise understood. Video Think-Alouds: I like to think of my 1 to 1 classroom as an opportunity to differentiate instruction and meet readers where they are. Here's an example of how I'm using technology to support close reading. Below is a screencast I created demonstrating close reading, in which I model cognitive practices like self-explanation, and self-regulation. For more on these theoretic concepts, check out my blog on research & learning. The best part of having a recorded screencast is that students can (and do) return to my instruction over and over. Two words: Free Reading. More than any other practice, this one has changed the climate of my class, and has shifted students' attitudes toward literature. Each day, students participate in FVR ~ Free Voluntary Reading. I decided to make the move toward the blended model of book selection, and to FVR in particular, after hearing Donalyn Miller present at NCTE a few years back. I was so excited by the possibility of students liking reading that I read her book, The Book Whisperer, and the follow-up, Reading in the Wild. These are two of the best professional development texts I have read in the past five years. I then picked up Stephen Krashen's The Power of Reading, and Kelly Gallagher's Readicide, and low and behold, I had a program on my hands. And they love it. Sometimes, the best thing we can do is just have a little fun. Recently, I was re-designing my back-to-school spiel, and remembered an awesome post I read from Megan Ellis, another Bay Area English teacher. She reminds me of how important it is to laugh, play, and not take ourselves so dang seriously. I remember my first year of teaching - I had a very serious first-day-of-school talk planned, with all kinds of warnings about the dangers of late homework, tardies, and gum chewing. I'm taking a bit of a different approach this year: memes.